Luap thanks for the Add! Hobbies? Motorcycles, building my Rock Crawler Jeep, trails and more trails camping etc. 3rd guzzi,and glad to get back on one,sure missed the feel of this exotic ride on my new mgx-21 flying fortress! 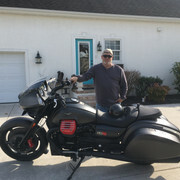 Tom Guzzi from Vineland N.J. Also ride a 2017 Indian Springfield, Hi All! Hello all...! Just picked up my first Guzzi...new 2016 Eldorado. Just got the windscreen and crash bars on her yesterday...and have been able to get a few miles on her...very sweet and impressive, I must say. I've been riding for quite a while and owned a lot of bikes, but something about this Eldorado is very unique and satisfying. Hope to meet some of you on the road...I split my time between Central Virginia (Culpeper area) and a farm in the Tidewater area of NC...ride safe. Welcome! Your bike is a good ride in the mtn. Hey Tom, check out our local Jersey forum. Small but dedicated group. Hope to see you out and about. The 16" wheels and tires make the bike handle really well in hairpin mtn. passes. Sweepers and straights will get boring.